This month’s challenge is the in the pot swirl (ITP) and in theory should have been easy since it is one of the first swirls that most soapers learn. Considering that I made five soaps trying to get one that I really really like to enter, this was anything but easy. I encountered problems with all of them. I personally like them all but for the challenge I was looking for something that really jumped out and say vote for me. 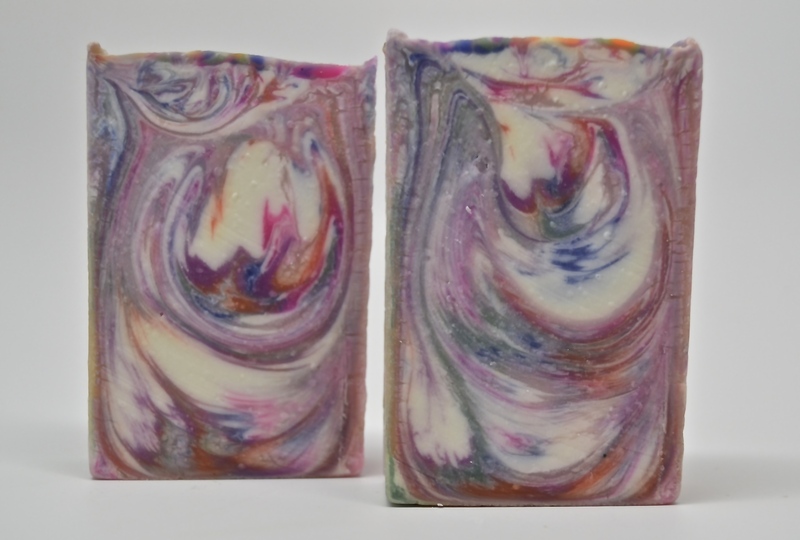 The first two soaps were based on the same color scheme from a picture that was posted on one of the Facebook groups that I belong to. Here is a picture showing the colors selected for the swirl. These soaps were scented with Brambleberry’s Energy. I think that fragrance actually slows trace. The first try my batter was a little thin. On the second try I thought I had a nice consistency but when I added the colors it seemed to thin up. As you can see the results were very similar. Even though the soap batter was thin and the colors blended in some areas you can still pick out all the colors. 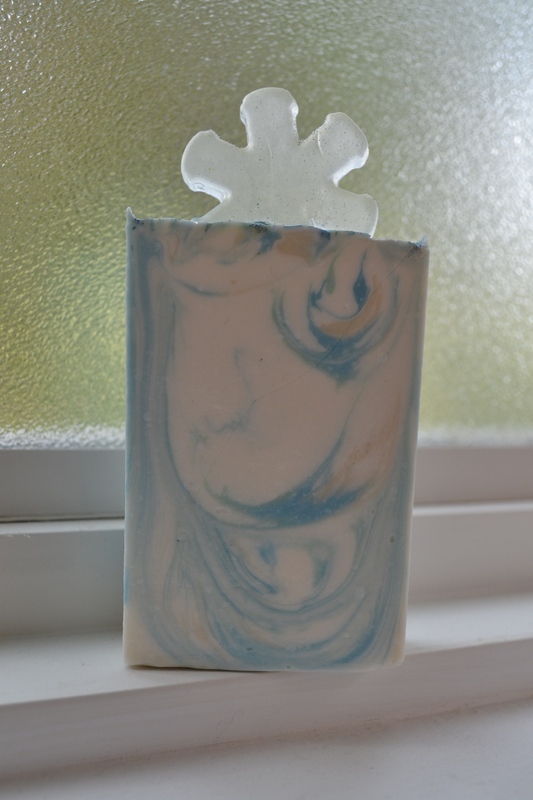 For the next try I decided to make a soap I had been planning for the winter season which is a tribute to the movie Frozen. 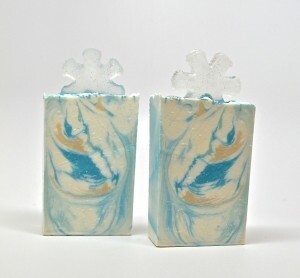 I scented this one with Fresh Snow and used four different colors of blue as well as titanium dioxide. 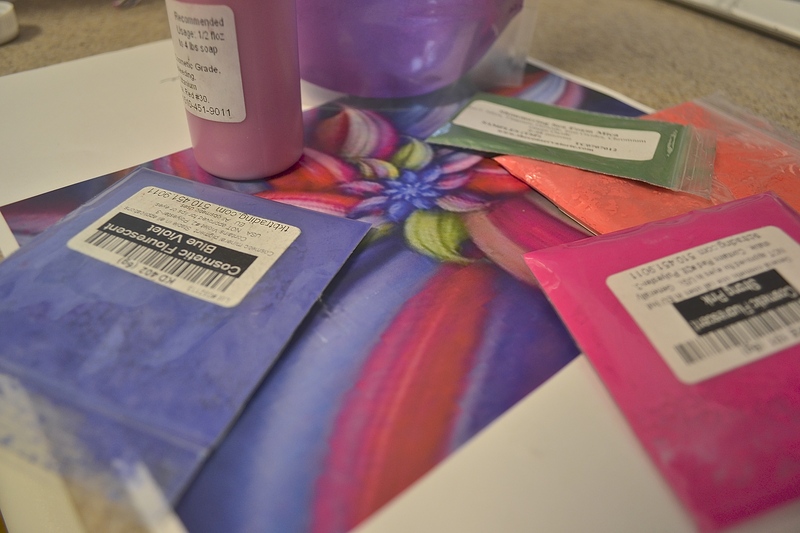 I thought I had tried all of these colors previously but apparently I had not used the Royal Blue mica. I couldn’t believe when I cut the soap I could only find three blues. Notice the soap as areas that look like natural uncolored soap. That is where the Royal Blue was. I used plastic cups to mix my colored soap and was able to retrieve them from the trash. Yeap the one that was used to mix the Royal Blue contained uncolored soap. This particular mica loses it color in cold process soap. In the picture the three blues that survived may not be clearly visible but in person they are. On to the fourth try. No pictures here. I planned nice fall colors to go with the Home for the Holidays fragrance I was using. Everything I read about this fragrance said it soaped beautifully so I did not hesitate to add it to my soap batter before separating out the portions. 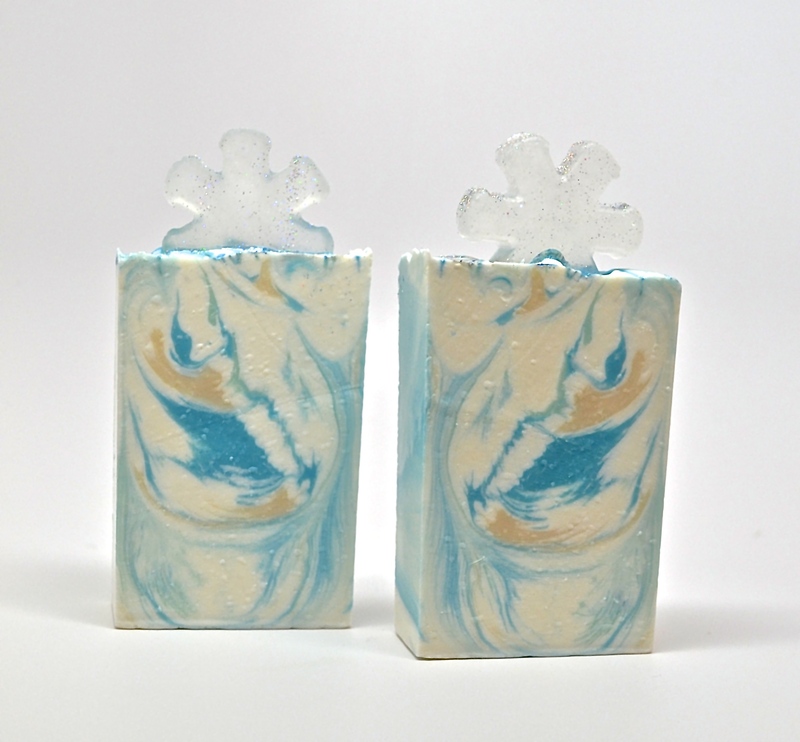 Oh no – soap on a stick!!! So out came the crock pot and now we have a rebatched white soap that smells wonderful – apples, mulled apple cider, apple pie – yum. But very plain. So I plan to borrow one of Amy’s techniques of stamping with a rubber stamp and mica. Final try. I used a fragrance from last year that I knew would not cause too much trouble – Twigs and Berries – and the same fall color scheme I had already planned. I mixed my colors but forgot to take a picture which is just as well because I had to add more color to get the look I was hoping for. I used brick red oxide but it looked too brown so I added some liquid red and crimson sparkle mica, brown oxide with brown sparkle mica, yellow oxide with liquid yellow added, chromium green oxide, and rainbow orange mixed with vibrance red and some bright orange liquid color. With all the mixing and fussing with the colors the base did get thicker than I like but it was still workable. All the colors in this one are clearly identifiable. My favorite of these is Frozen but I will not enter it since one of the colors is missing. The first two are nice but should have had more of the blue and the colors melded in a few areas. So that leaves Twigs and Berries for my entry. I definitely learned a few things from this challenge. Such as 1) make sure you are at medium trace; 2) know your fragrance (don’t believe everything you read); 3) test your colors and 4) never assume it is going to be easy. Thank you Amy once again you have sponsored a fun challenge And once again I am reminded of why this is called a “challenge”. 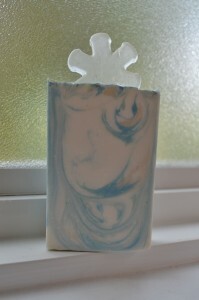 As much as I like your “Frozen” soap (it’s lovely, and the colours are stunning – even though 1 disappeared! ), I think that the colours and swirls you got in Twigs and Berries make it more interesting ….. It’s stunning! Thank you Debbie. I haven’t had time to look at the other entries yet – getting ready to go to my farmers market today. It is always so much fun to see what everyone does. I know what you mean by that we need medium trace! Too thin a trace and the colors get mixed, too thick and the swirl does not get right. Your entry is beautiful. Though Frozen is beautiful, too, I think yoou made the right choice for the challenge! Your soaps are beautiful!!! I love the Twigs & Berries. Yes Sherri it is fun. Thank you. I love the Twigs and Berries! 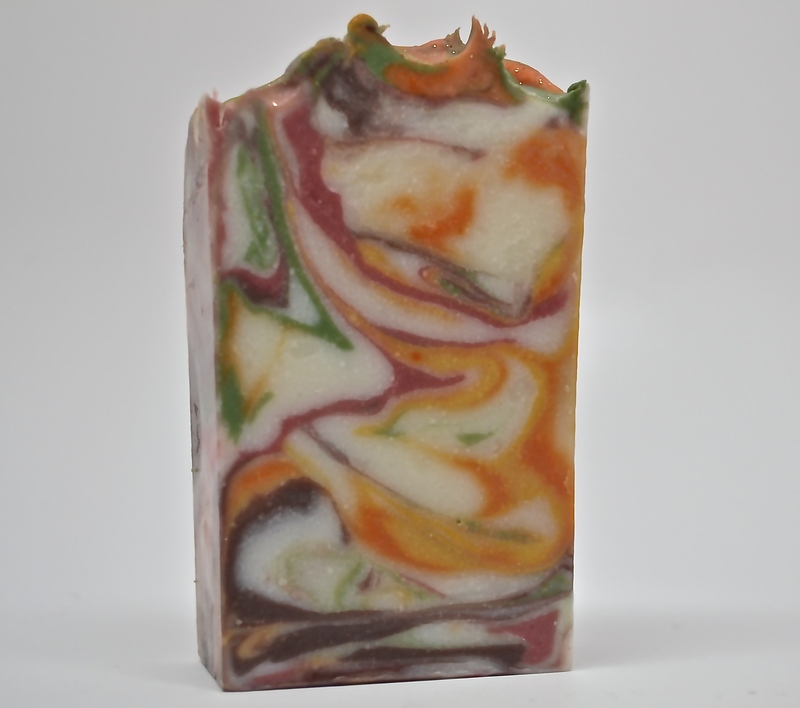 That’s a gorgeous soap for fall, and the colors are very distinct. Great job! Love your twigs and berries swirls! You might find your frozen soap blue might reappear. I had that happen to a batch. When it finally cured, the color came back. Oh yes!! 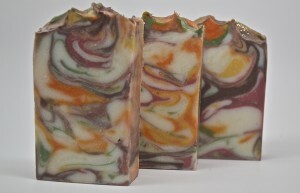 I love the wisdom you shared from all your batches and the beautiful results from the Twigs & Berries soap! Thanks Amy. Your encouragement means a lot. I love the soap you entered! I love the clear delineation of colours from the swirl. Wow, your Twigs and Berries turned out awesome! Great fall colors and awesome swirls! Twigs and Berries is a good choice but I also like your version of Frozen as well – even without the additional blue you were hoping would show up. They are all so lovely, and I love that you took every time new colors! Great done!